In this MapReduce Tutorial blog, I am going to introduce you to MapReduce, which is one of the core building blocks of processing in Hadoop framework. Before moving ahead, I would suggest you to get familiar with HDFS concepts which I have covered in my previous HDFS tutorial blog. This will help you to understand the MapReduce concepts quickly and easily. Let us understand, when the MapReduce framework was not there, how parallel and distributed processing used to happen in a traditional way. So, let us take an example where I have a weather log containing the daily average temperature of the years from 2000 to 2015. Here, I want to calculate the day having the highest temperature in each year. Critical path problem: It is the amount of time taken to finish the job without delaying the next milestone or actual completion date. So, if, any of the machines delays the job, the whole work gets delayed. Reliability problem: What if, any of the machines which is working with a part of data fails? The management of this failover becomes a challenge. Equal split issue: How will I divide the data into smaller chunks so that each machine gets even part of data to work with. In other words, how to equally divide the data such that no individual machine is overloaded or under utilized. Single split may fail: If any of the machine fails to provide the output, I will not be able to calculate the result. So, there should be a mechanism to ensure this fault tolerance capability of the system. Aggregation of result: There should be a mechanism to aggregate the result generated by each of the machines to produce the final output. These are the issues which I will have to take care individually while performing parallel processing of huge data sets when using traditional approaches. To overcome these issues, we have the MapReduce framework which allows us to perform such parallel computations without bothering about the issues like reliability, fault tolerance etc. Therefore, MapReduce gives you the flexibility to write code logic without caring about the design issues of the system. MapReduce Tutorial: What is MapReduce? 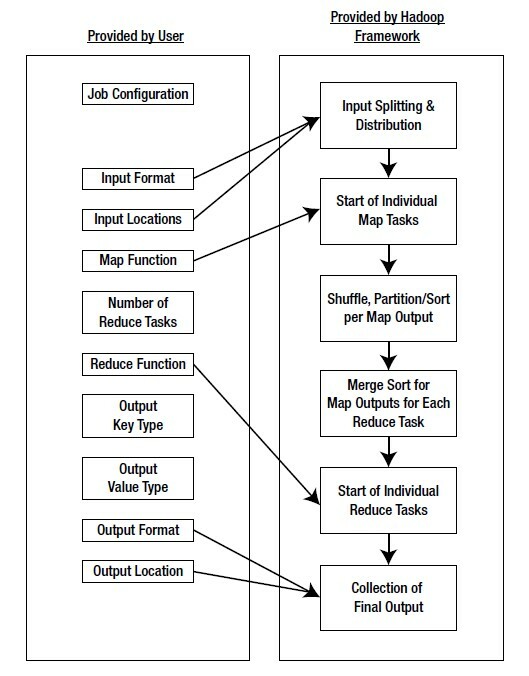 MapReduce consists of two distinct tasks – Map and Reduce. As the name MapReduce suggests, reducer phase takes place after mapper phase has been completed. The output of a Mapper or map job (key-value pairs) is input to the Reducer. JobConf is the framework used to provide various parameters of a MapReduce job to the Hadoop for execution. The Hadoop platforms executes the programs based on configuration set using JobConf. The parameters being Map Function, Reduce Function, combiner , Partitioning function, Input and Output format. Partitioner controls the shuffling of the tuples when being sent from Mapper node to Reducer nodes. The total number of partitions done in the tuples is equal to the number of reduce nodes. In simple terms based on the function output the tuples are transmitted through different reduce nodes. Input Format describes the format of the input data for a MapReduce job. Input location specifies the location of the datafile. Map Function/ Mapper convert the data into key value pair. For example let’s consider daily temperature data of 100 cities for the past 10 years. In this the map function is written such a way that every temperature being mapped to the corresponding city. Reduce Function reduces the set of tuples which share a key to a single tuple with a change in the value. In this example if we have to find the highest temperature recorded in the city the reducer function is written in such a way that it return the tuple with highest value i.e: highest temperature in the city in that sample data. The number of Map and Reduce nodes can also be defined. You can set Partitioner function which partitions and transfer the tuples which by default is based on a hash function. In other words we can set the options such that a specific set of key value pairs are transferred to a specific reduce task. For example if your key value consists of the year it was recorded, then we can set the parameters such that all the keys of specific year are transferred to a same reduce task. The Hadoop framework consists of a single master and many slaves. Each master has JobTracker and each slave has TaskTracker. Master distributes the program and data to the slaves. Task tracker, as the name suggests keep track of the task directed to it and relays the information to the JobTracker. The JobTracker monitors all the status reports and re-initiates the failed tasks if any. Combiner class are run on map task nodes. It takes the tuples emitted by Map nodes as input. It basically does reduce operation on the tuples emitted by the map node. It is like a pre- reduce task to save a lot of bandwidth. We can also pass global constants to all the nodes using ‘Counters’. They can be used to keep track of all events in map and reduce tasks. For example we can pass a counter to calculate the statistics of an event beyond a certain threshold. Now, suppose, we have to perform a word count on the sample.txt using MapReduce. So, we will be finding the unique words and the number of occurrences of those unique words. First, we divide the input in three splits as shown in the figure. This will distribute the work among all the map nodes. Then, we tokenize the words in each of the mapper and give a hardcoded value (1) to each of the tokens or words. The rationale behind giving a hardcoded value equal to 1 is that every word, in itself, will occur once. Now, a list of key-value pair will be created where the key is nothing but the individual words and value is one. So, for the first line (Dear Bear River) we have 3 key-value pairs – Dear, 1; Bear, 1; River, 1. The mapping process remains the same on all the nodes. After mapper phase, a partition process takes place where sorting and shuffling happens so that all the tuples with the same key are sent to the corresponding reducer. So, after the sorting and shuffling phase, each reducer will have a unique key and a list of values corresponding to that very key. For example, Bear, [1,1]; Car, [1,1,1].., etc. Now, each Reducer counts the values which are present in that list of values. As shown in the figure, reducer gets a list of values which is [1,1] for the key Bear. Then, it counts the number of ones in the very list and gives the final output as – Bear, 2. Finally, all the output key/value pairs are then collected and written in the output file. In MapReduce, we are dividing the job among multiple nodes and each node works with a part of the job simultaneously. So, MapReduce is based on Divide and Conquer paradigm which helps us to process the data using different machines. As the data is processed by multiple machine instead of a single machine in parallel, the time taken to process the data gets reduced by a tremendous amount as shown in the figure below (2). Moving huge data to processing is costly and deteriorates the network performance. Processing takes time as the data is processed by a single unit which becomes the bottleneck. Master node can get over-burdened and may fail. It is very cost effective to move processing unit to the data. The processing time is reduced as all the nodes are working with their part of the data in parallel. Every node gets a part of the data to process and therefore, there is no chance of a node getting overburdened. Before jumping into the details, let us have a glance at a MapReduce example program to have a basic idea about how things work in a MapReduce environment practically. I have taken the same word count example where I have to find out the number of occurrences of each word. And Don’t worry guys, if you don’t understand the code when you look at it for the first time, just bear with me while I walk you through each part of the MapReduce code. We will understand the code for each of these three parts sequentially. We have created a class Map that extends the class Mapper which is already defined in the MapReduce Framework. We define the data types of input and output key/value pair after the class declaration using angle brackets. Both the input and output of the Mapper is a key/value pair. Example – Dear 1, Bear 1, etc. We have written a java code where we have tokenized each word and assigned them a hardcoded value equal to 1. We have created a class Reduce which extends class Reducer like that of Mapper. We define the data types of input and output key/value pair after the class declaration using angle brackets as done for Mapper. Both the input and the output of the Reducer is a key-value pair. Example – Bear, [1, 1], etc. Example – Bear, 2; Car, 3, etc. We have aggregated the values present in each of the list corresponding to each key and produced the final answer. In general, a single reducer is created for each of the unique words, but, you can specify the number of reducer in mapred-site.xml. In the driver class, we set the configuration of our MapReduce job to run in Hadoop. We specify the name of the job , the data type of input/output of the mapper and reducer. We also specify the names of the mapper and reducer classes. The path of the input and output folder is also specified. The method setInputFormatClass () is used for specifying that how a Mapper will read the input data or what will be the unit of work. Here, we have chosen TextInputFormat so that single line is read by the mapper at a time from the input text file. The main () method is the entry point for the driver. In this method, we instantiate a new Configuration object for the job. Now, you guys have a basic understanding of MapReduce framework. You would have realized how the MapReduce framework facilitates us to write code to process huge data present in the HDFS. There has been significant changes in the MapReduce framework in Hadoop 2.x as compared to Hadoop 1.x. These changes will be discussed in the next blog of this MapReduce tutorial series. I will share a downloadable comprehensive guide which explains each part of the MapReduce program in that very blog.